Verdict - An enjoyable and heart-warming musical with great performances by the entire cast. When the trailer of Fanney Khan came out, it got us all hooked. It looked like a blockbuster. But sadly, the film didn’t live up to the hype. Inspite of big time names leading the cast like Anil Kapoor and Aishwarya Rai, the film’s storyline fails to impress. The sets looked a little fake and so did Aishwarya’s acting. Anil Kapoor and Rajkumar Rao are the only saving grace. Anil Kapoor’s acting is phenomenal and he looks every bit of the concerned and devoted father. Rajkumar too, plays the role of a sweet, simple guy convincingly. The movie revolves around Prashant Kumar aka Fanney Khan who is an armature band singer. He isn't able to fulfill his dream of becoming a popular singer so he begins to see similar dreams for his daughter, Lata and goes an extra mile help her achieve this dream. There are two issues highlighted in this movie are fat shaming of Lata by society and problems of lower middle class struggling artists. However, the movie isn't able to properly address both the issues simultaneously. I feel Baby Singh ,played by Aishwarya Rai , and Adhir ,played by Rajkumar Rao deserved more screen presence and a better script. Funny idea-Funny execution-silly unbelievable script thus makes Fanney Khan! Fanney Khan directed by first time director Atul-Manjrekar is an officially inspired remake of 2002 Oscar nominated Belgium film ‘Everybody’s Famous!’, and well it turns out to be a complete lackluster in effect on all senses. Fanney Khan is a story about soaring hopes, dreams and the delicate relationship of a father-daughter. It’s about an ambitious father who failed in life when he aspired to become MD. Rafi in showbiz now promises to stop at nothing in order to make his daughter Lata a singing sensation. The film has an amazing star cast. We have ‘oh-so-booming-with-energy’ Mr. Anil Kapoor as Prashant Sharma a.k.a Fanney Khan who is an over concerned, besieged and ambitious father, gorgeous Aishwarya Rai as India’s ultimate singing sensation Baby Singh, cute face and chubby Pihu Sand as Lata(inspired by Lata Mangeskar) who aspires to enter the showbiz world but is frequently body shamed, Divya Dutta as Lata’s doting mother and finally super charming and extremely talented RajKumar Rao as Adhir who is partner in crime/trusted friend of Prashant. In spite of rolling in this starry cast, the film fails to connect with the audience. Prashant Sharma a.k.a Fanney Khan hankers on a dream to make his daughter achieve a stardom position like Lata Mangeshkar and plans to fulfill his dream to all extent. After losing his job as a factory worker, Fanney Khan works diligently hard to make ends meet and starts driving a taxi for an old friend Kader (Satish Kaushik). Pihu who is blessed with good voice, dances and sings like a nightingale but is body shamed on stage as she is size plus. Quite often she has to face the wrath of his audience and receive comments like "Dekha hai apne aap ko mirror mein kabhi," which greatly dissuades her dedication towards music. The relationship that they both share is quite resolute and committed towards making her a success in showbiz industry. Prashant’s character sets in the right kind of example of a middle class man pushing his 50’s surviving with his family in the city of dreams and reality i.e. Mumbai. Until now, the narrative largely falls together and is cute with its theatrics and relationship of Pihu with her loving parents. However, it becomes quite absurd when the ludicrous plot of abducting Baby Singh for a ransom occurs. Pihu is a huge fan of Baby Singh and very fond of her styling. Prashant who is a worried father plans to kidnap Baby for a ransom so that he could purchase a ticket for his daughter’s entry into a reality show which he is unable to buy himself. One fine day, Baby fights with her sleazy manager and boards a cab whose driver is none other than our Fanney Khan. Grabbing the opportunity, Fanney sedates Baby with sleeping pills and drives her to an inoperative factory to keep her as a captive. At this point he calls in his trusted friend Adhir for assistance. However, the second half gets super boring and uneventful, only honest performance given by Anil Kapoor keeps it going. There is no genuine backdrop story for Baby Singh and the sole person in her life is her creepy calculative manager Karan (Girish Kulkarni). Rai hardly gets into the character and can only be viewed in a gorgeous aspect. The trusted aide character Adhir is played by Rajkumar and he quite lives up to it. Since the character does not require depth, Rao’s portrayal of Adhir is adorable and funny. His character develops a deep bond with Baby’s and they both start appreciating each other’s existence, he even agrees to find Baby’s beagle Ustad from her apartment. The whole sequence of holding Baby captive is very lame and silly. The victim’s expression is never scared and the kidnappers are all sweet and courteous to her. The movie is a sheer disappointment at two levels; firstly, there is no storyline of police or any investigation. If a singing sensation like Baby is held hostage, some kind of a buzz is bound to be generated. Secondly, the story which started off on the lines of body shaming issues and how it majorly affects a young soul who is trying to find and channelize her inner self is completely distorted and entirely miss by the end. No where do we get to encounter a moral lesson or realization kicking in the audience to quit body shaming and understand the flaws of it. The narrative work in its own silly way, the crucial issues are discussed but hardly explored. The production may have chosen this Oscar nominated film in order to gain good bucks but they clearly missed the concept of good script and appropriate cast. The film has its own little highs; especially this dialogue by emotional Prashant while naming his daughter with teary eyes "MainMohammed Rafi toh nahin ban saka tujhe zaroor Lata Mangeshkar banaoonga," made the crowd ‘Awwww’. Then we have genuine and appreciable acting done by Divya as a supportive mother and doting wife. Musically the film has some interesting songs which makes us hum for a while like ‘Achche Din’, ‘Badan pe sitare lapete huye’ and ‘Mohabbat’. 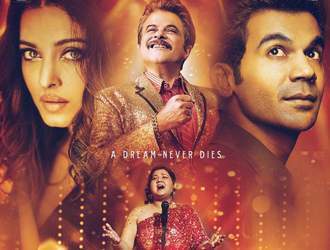 Overall, Fanney Khan works as a sweet tale hardly pulling heartstrings or gathering momentum in effect to all senses. Many a film have been made where the parent desires and sacrifices to ensure success for their daughter .What they couldn't acheive ,they transpose to their progeny.Fanney Khan belongs to this category. There's a typical low middle class family - Prashant Sharma aka Fanney Khan( Anil Kapoor),a factory supervisor ,his devoted home maker spouse ( Divya Dutta) and their singer aspirant daughter Lata( Pihu Sand).She longs to be seen in the tube a la Baby Singh( Aishwariya Rai Bachchan). The daughter is on the 'wrong side' in terms of weight and hence has an inferiority complex as being non presentable . She has been sounded by her ' mod friends' that talent is nothing but styling and making ' compromises'. The situation becomes more desperate when the dad looses his job in factory being closed.Will his dreams be realised?. In one of his taxi job alternate job his passenger happens to be Baby Singh.He ' kidnaps' her for a ransom.The money is needed to launch her daughter's album.Does he succeed? Does her daughter become a ' star'? Go see for your self. Where does FK score? Off course in it's intent,sincerety and performances by the dad and her daughter.The lesson- talent has no boundary,it can't be shackled' it requires no styling ,show biz is not about ' size',such complex needs to be shed,etc. In his remarks to HT City Anil Kapoor has hit the nail on it's head by saying" Music hasn't changed,what's changed is that today ,people 'see' music,they see you sing ,and not hear you sing-- earlier ,it was simple : just go in front of the mic and sing,only talent mattered ,now it's the entire package'. We are all God's creation .Be what we are and ytiluse your talents to the best in any field if your choice .Academics is not the be all and end of life. The visual media is in look out for new talents. The climax was damn well presented.It never looked to be contrived.Pihu( the debutant) was confident in her debut role. What FK lacked? To me the pairing of Aish with Rajkummar Rao was awful.The ' kidnap ' scenes looked foolish.A new bee girl like say Disha Patni or even a new comer would have a better cast as Baby Singh. All in all FK is a sincere attempt but lacks the mass appeal to be a success at the BO.